The playoffs are here! This win or go home match-up features the third and fourth best teams in baseball by record (or fourth and sixth by run differential), and, if prior Wild Card Games are any indication, it’s poised to be extraordinarily exciting. So who’s ready for a night of stressful baseball? I know I am. The Yankees and A’s met six times this year, splitting the season series three games apiece; both teams took two of their three home games. The A’s outscored the Yankees 33 to 28, with that edge coming from their last meeting of the regular season, which the A’s won 8-2. Four of the six games were decided by at least four runs, with the only close game coming way back on May 12; it was an extra innings affair that the Yankees won 7-6 thanks to a Neil Walker walk-off single. Luis Severino faced the A’s in both series. The first time, at Yankee Stadium, he pitched quite well – 6.0 IP, 5 H, 1 R, 2 BB, 7 K. The next time around, things didn’t go quite so well, as he surrendered 6 runs (5 earned) in 2.2 IP. It was, by Game Score, his worst start of the season. Here’s hoping for more of the former than the latter. Not much has changed since these teams met a month ago; the A’s are essentially at full strength. The A’s finished 97-65 with a +139 run differential, and it was basically a tale of two seasons for them. They sat at 29-28 with a -7 run differential heading into June, which was in-line with most of the projection systems out there. From June 1 forward, however, they went 68-37 with a +146 run differential – and looked downright unbeatable at times. Painting in broad strokes, the A’s were a well-rounded team this year, finishing tied for second in wRC+ (110 as a team), 10th in ERA+ (109), and 10th in defensive runs saved (+25). Mark Canha (113 wRC+ in 411 PA) is their lefty-masher off the bench, and Chad Pinder (113 wRC+ in 333 PA) can play almost every position. I reckon that we’ll see both tonight. 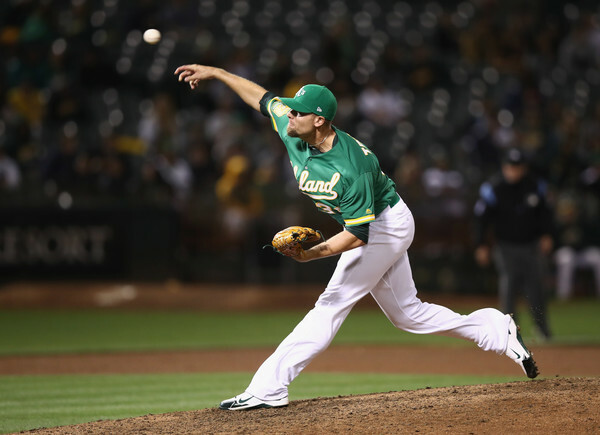 Liam Hendriks will be starting – or ‘opening’ – for the A’s tonight. He pitched to a 4.13 ERA (102 ERA+) in 24.0 innings in what was a fairly crazy year. He underwent surgery to remove a cyst earlier this year, needed a platelet-rich plasma injection for a torn hip tendon, and was designated for assignment back in June – at which point he had a 7.36 ERA. He didn’t return to the A’s until September 1, but from that point forward he had a 1.38 ERA in 13.0 IP. And his performance was enough for the A’s to trot him out there to kick things off in the Wild Card game. The 29-year-old righty primarily throws three pitches – a mid-90s four-seamer, a low-to-mid 90s sinker, and a high-80s slider. He’ll mix in a change-up and curve at times, but I don’t think that we’ll see many of those in what should be an ‘air it out’ sort of appearance. The second through fifth innings will likely call for some combination of Lou Trivino, Shawn Kelley, Yusmeiro Petit and Ryan Buchter. From there, Oakland would roll out setup men Fernando Rodney and Jeurys Familia for one inning apiece ahead of Treinen’s entrance. That’s a heck of a bullpen, with several dominant arms. Treinen was arguably the best reliever in baseball this year, and the options in front of him vary from solid to great. By WPA this was the best bullpen in baseball, and by fWAR it was fifth – and this is the best sample of that group. This section feels kind of meaningless, doesn’t it? You’re watching a winner take all game between two well-matched teams – and, if you’re reading this, you’re a big-time fan of one of those teams. That won’t stop me from pointing out a few things, though. These are two juggernaut bullpens. The Yankees were 1st in fWAR and 3rd in WPA, and match-up well with the A’s from top to bottom. How Melvin and Boone deploy their relievers may well be the determining factor in this game. These are also two of the most prolific power-hitting teams in baseball, too. 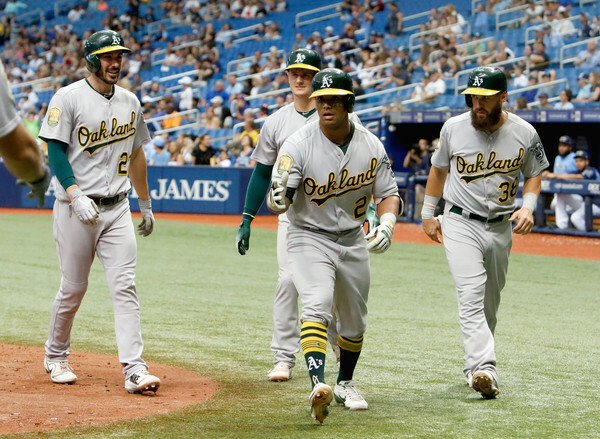 The Yankees finished first in home runs and ISO, and the A’s finished third in both – and the A’s play in a park that’s not terribly conducive to power. The Yankees have six players with 20-plus home runs, and the A’s have five. And there’s a ton of history between these teams, to boot.